Recently, here at Embroidery Gatherings, we updated and re-launched this website and our Embroidery Gatherings Membership Community. 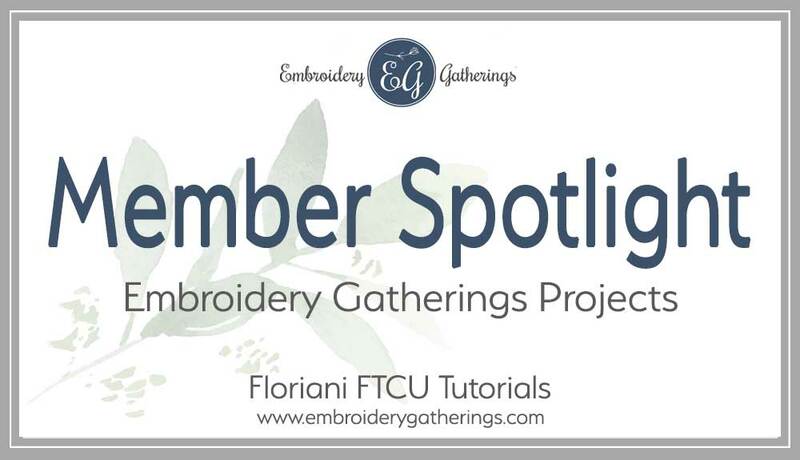 All of the Members have been busy learning and practicing the Floriani FTCU tutorials that are available to them. With the new update, we now have opened our Community Forum as another place to ask your questions, get answers and learn from others, as well as, to share your digitizing wins with everyone! 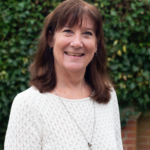 This week I want to feature one of our awesome members. 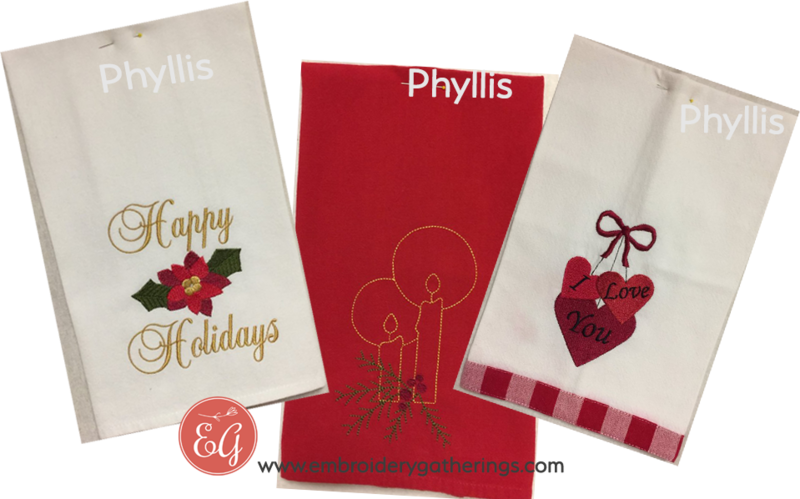 Her name is Phyllis and she has been a member of Embroidery Gatherings for over a year. She recently shared with us, all of her finished projects that she has created with the many tutorials inside the Membership Club. They are so beautifully done! I am so impressed with her enthusiasm for the Embroidery Gatherings lessons and just wanted to share her photos with everyone here on the website. 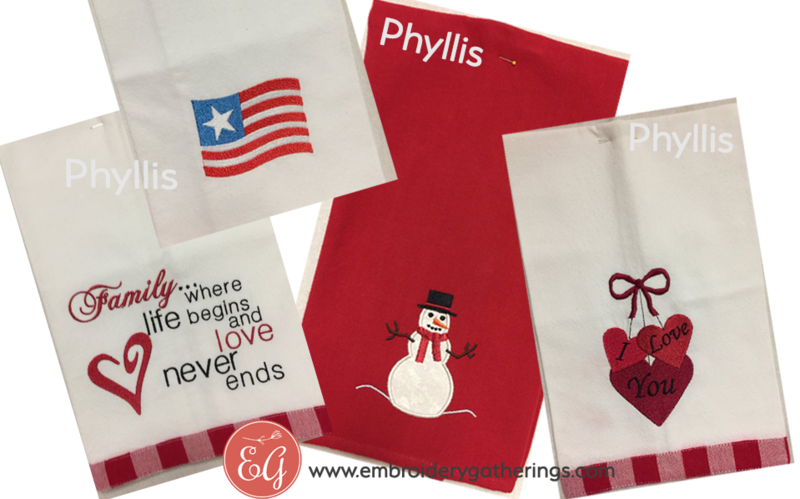 These are great towels using the Fall season designs. I love the baby bib! So cute! Here’s some holiday towels. The center one is a Redwork Candle. Some more reds for the winter season! Love the Family towel! 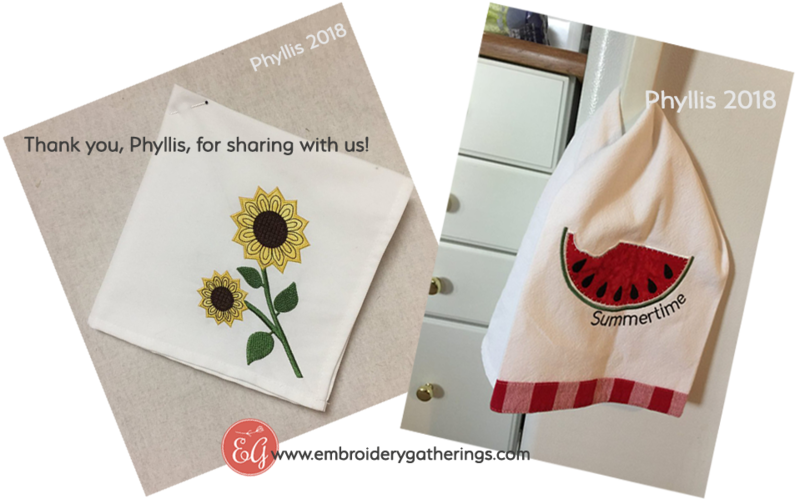 It is so fun to see the Embroidery Gatherings tutorials actually come to life as real projects! And these are two of my favorite designs. The watermelon is so cute on that towel. It’s perfect for hanging in a kitchen! 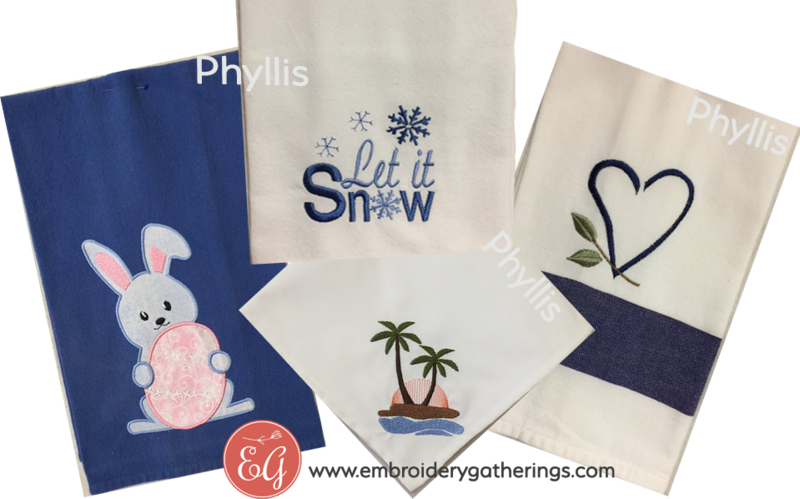 All of the above designs came from the tutorials in the Embroidery Gatherings Membership Club and were digitized by Phyllis. I love that she was able to take the lessons and make something useful with them. Thank you, Phyllis, for letting me share these wonderful photos! Learning to digitize with FTCU is very rewarding. You too, can create your own ideas and make them come to life. 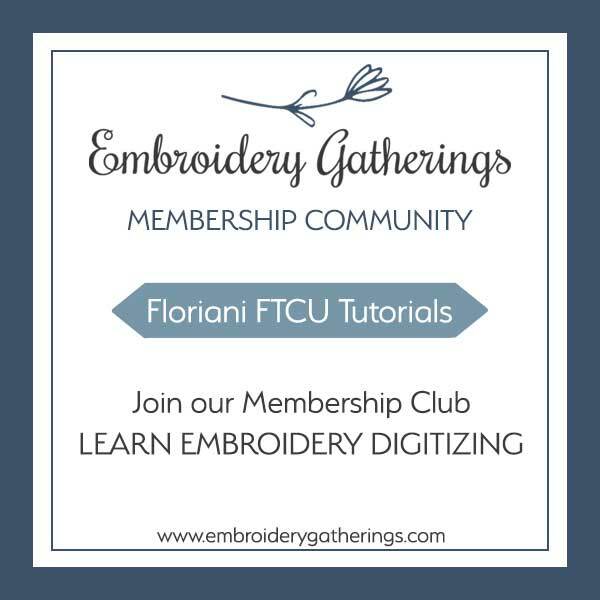 If you would like more information about these tutorials and joining the Embroidery Gatherings Membership Club, click HERE. As always, I will be happy to answer any questions that you have, anytime. 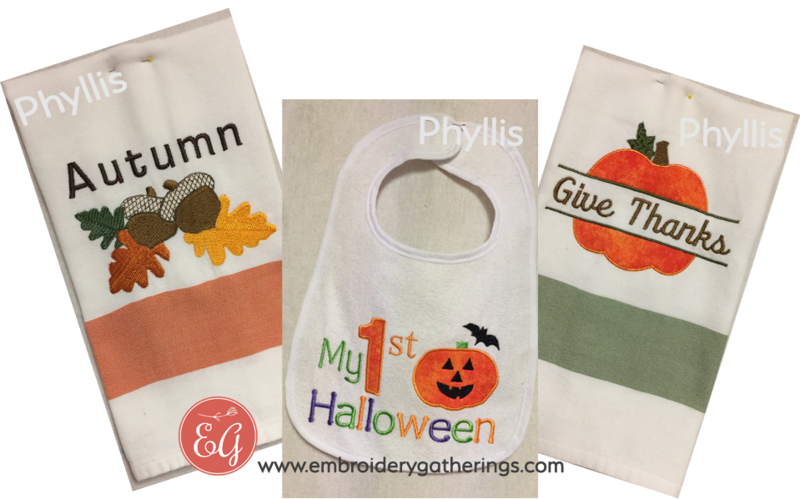 You can email me at: paula@embroiderygatherings.com. These are all wonderful examples and inspiration for me. Thank you for sharing with us. These will make me try harder to understand and use what I learn. Phyllis, these are beautiful. You have done an excellect job! You’re welcome! I agree, seeing these lessons in real life is very encouraging to keep practicing FTCU. I am so glad she allowed me to share them with everyone. Thanks Paula for all your kind remarks and sharing them with everyone. Now on to your new things under your new format. You’re welcome, Phyllis. So happy that I could share them. They are awesome!